The Cliffs 7301 is spacious oceanfront unit on the 3rd (top) floor at the end of a building with a spectacular view. It encompasses over 1500 square feet of luxury, all dedicated to your comfort when you are not out enjoying the beauty of Kauai. It is ideal for groups of up to four adults or a family with children. Located on the spectacular bluffs of Princeville, on Kauai's North Shore, it affords every opportunity for exploring and enjoying this amazing island. The Cliffs resort amenities include beautiful pools, outdoor jacuzzis, barbecue grills, free tennis courts, a putting green (golf nearby), a childrens' play area with basketball and shuffleboard, and a book exchange library. State of Hawaii taxes include Excise Tax in the amount of 4.712% and Transient Accommodations Tax in the amount of 10.25%. Bath linens are provided. Hair dryers in both bathrooms. Ocean view from living room, kitchen, dining area and lanai. The resort is located on a dramatic bluff overlooking the ocean. Our unit faces Northeast so it catches the balmy trade-winds and avoids the heat of direct sun in the afternoon. The breezy living room is superbly furnished and has a 32' flat-screen color television with cable, Blu-ray DVD player, a stereo system with CD player and a ceiling fan. The living room has a wonderful view of the Pacific and opens onto a lanai for an even closer view, perfect for an early morning tropical breakfast or for whale-watching in winter months. The kitchen is very completely equipped for convenient meal preparation with dishes and flatware, pots and pans, utensils and gadgets you might need (coffee-maker, coffee grinder, blender, toaster, etc.). Washer/dryer, hair dryers, iron and ironing board, vacuum, and supplies for light cleaning are kept in the unit as well. This beautiful oceanfront condo is our 'home away from home.' We maintain it so our guests will be completely comfortable whether staying for only a few days or several weeks. In addition to the comforts of the condo interior and the spectacular ocean view, guests enjoy all the resort amenities at The Cliffs--even assistance from their friendly staff for planning island activities. Discounts are offered to Cliffs guests on the adjacent Princeville golf courses. It's the perfect place for experiencing the paradise that is Kauai in five-star resort comfort! Other Activities: Shopping, Kayaking, Playgrounds, Basketball, Shuffleboard, Tropical Gardens, snorkeling, boogie boarding. 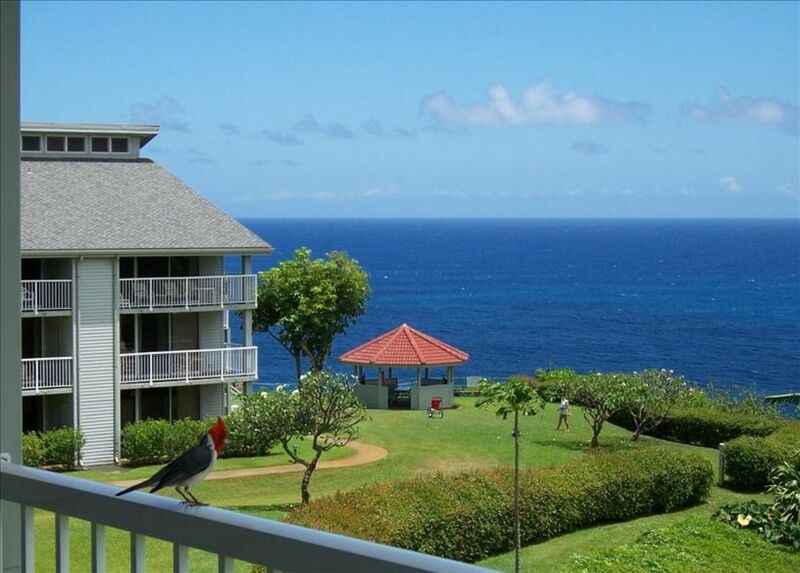 Golf: This stunning, family-friendly unit is just blocks from one of Hawaii's top-rated golf courses. Golf discounts are offered to guests at The Cliffs.